I am a big fan of the original How To Train Your Dragon movie. It was a really great story with good characters and design. Now only if it was as easy to train my little one right?! lol When I heard that Dream Works was making another movie with the same characters and more dragons I was excited to watch it. I have always loved the time period the movies take place with Vikings and my son loves anything with cool stuff like Dragons and Hats! He yelled "Hat" and point to his own at least 15 times during this short movie. I liked the Holiday storyline in Night Fury with Hiccup and his friends celebrating Snoggletog, their winter holiday. For a short movie is was delightful to see the great characters again. The Book of Dragons was a short about all the different types of dragons that live in Hiccup's town. They all have different personalities. These two short films are perfect to excite any Dragon fan for the upcoming 2014 full length film! My son and I had a blast watching this movie. We wore Viking hats, read the DreamWorks book and made Viking S'mores, minus the dragon breathe to roast the marshmallow of course. I am sure they would have tasted much better that way! 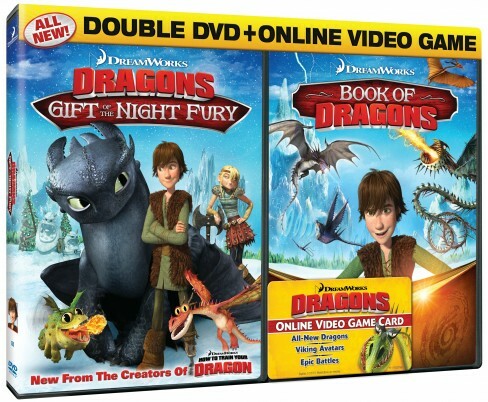 DREAMWORKS DRAGONS Double DVD + Online Video Game Pack includes the follow-up “Gift of the Night Fury,” in which the epic story of Hiccup and Toothless picks up where it left off and they take flight in a thrilling, all-new adventure to discover an island of never-before-seen dragons; the all-new “Book of Dragons” that reveals seven never-before-seen dragons as Hiccup, Astrid and Gobber share insider training secrets and new dragon mythology; AND a game card that grants exclusive access to the ultimate interactive Dragons challenge: a brand new Dragons Online Video Game in which players use the new training secrets they’ve learned to earn badges as they fight and train new dragons to become the ultimate dragon trainer. 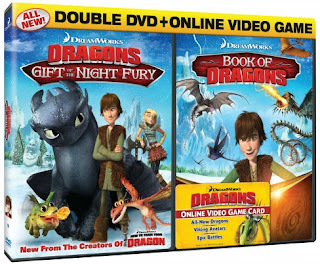 This DVD pack is now available to purchase and would make a great Holiday gift for any Hiccup and Toothless fan! You can find it at Walmart, Target and online at Amazon. *I was not paid or compensated for this post. 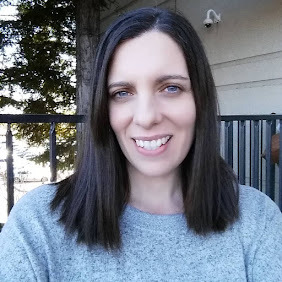 The opinions in this post are 100% mine and may vary from other opinions. I was provided for free a copy of the movie, the book, hats and smores kit for my review by the PR Company/Brand that represents them.